March 23, 2010 -- A study of more than 10,000 asymptomatic screening subjects found that more than one in 200 had unsuspected and typically large but mostly early-stage cancers detected outside the colon at virtual colonoscopy (also known as CT colonography or CTC). "We are finding that virtual colonoscopy screening actually identifies more unsuspected cancers outside of the colon than within it," said lead author Dr. Perry Pickhardt in a statement accompanying publication of the results in the April issue of Radiology. "As with asymptomatic colorectal cancers identified by virtual colonoscopy screening, these cancers are often detected at an early, curable stage." Pickhardt is a professor of radiology at the University of Wisconsin School of Medicine and Public Health in Madison. The study results have important implications for colorectal cancer screening, not all of which afford easy answers. "In practice, extracolonic evaluation at CT colonography represents a double-edged sword, with potential benefits related to the reassurance that important disease is absent in the great majority of patients and to the preclinical detection of an unsuspected but clinically important disease process in a small minority," wrote Pickhardt and colleagues including Dr. David Kim, Dr. Ryan Meiners, and Dr. Brooks Cash. "Potential harms include the anxiety, inconvenience, potential complications, and added costs related to additional diagnostic workup for findings that ultimately prove to be unimportant" (Radiology, April 2010, Vol. 255:1, pp. 83-88). But the experience of the study to date has allayed early concerns about the detection of extracolonic abnormalities, Pickhardt told AuntMinnie.com. "Extracolonic evaluation at CTC has been mislabeled as a relative disadvantage," he said. "In our experience, there appears to be a clear net benefit related to the detection of unsuspected but important findings such as cancer and aortic aneurysms. The exam can also be used to screen for osteoporosis, among other things." In May 2009, the U.S. Centers for Medicare and Medicaid Services (CMS) rejected a national coverage decision that would have paved the way for Medicare reimbursement of the exam. Ironically, one point CMS used to argue against the wider use of virtual colonoscopy was "uncertainty" relating to VC's ability to detect extracolonic findings, as well as potential expenses and complications related to their follow-up and treatment. The findings of the present study, and those of previous studies, suggest that those fears may have been misplaced. In any case, in the past two years a number of private payors, along with the American Cancer Society, have embraced VC for colorectal cancer screening, putting the U.S. government, at least temporarily, in the back seat for the next stage of VC's evolution. Coronal image shows unsuspected cancer (partially imaged spiculated mass) involving the right lung. All images courtesy of Dr. Perry Pickhardt. In their retrospective study, the researchers aimed to determine the detection rates, clinical stages, and short-term patient survival for all unsuspected cancers identified at screening CT colonography, including both colorectal carcinoma (CRC) and extracolonic malignancies. The cohort that underwent screening CTC in Wisconsin and at the National Naval Medical Center in Bethesda, MD, between 2004 and 2008 -- consisting of 10,286 outpatient adults (5,388 men, 4,898 women; mean age, 59.8 years) -- is one of the largest ever assembled for a CTC study, giving the results an important place in the literature and perhaps in the fraught politics of CTC as well. All individuals in the study cohort underwent screening CTC with images acquired in prone and supine views, following standard bowel preparation using a saline laxative (magnesium citrate or sodium phosphate) with barium and diatrizoate for stool and fluid tagging. Automated CO2 insufflation (ProtoCO2l, Bracco Diagnostics, Princeton, NJ) was used for colonic insufflation before low-dose image acquisition on a 16- or 64-detector-row CT scanner (GE Healthcare, Chalfont St. Giles, U.K.). 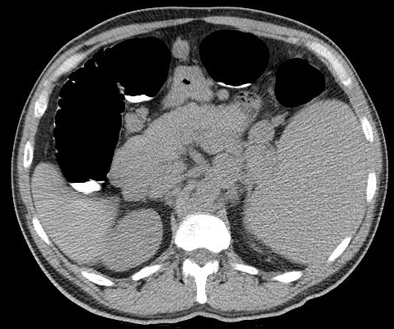 Image demonstrates splenomegaly and massively enlarged lymph nodes in a patient with unsuspected non-Hodgkin's lymphoma. 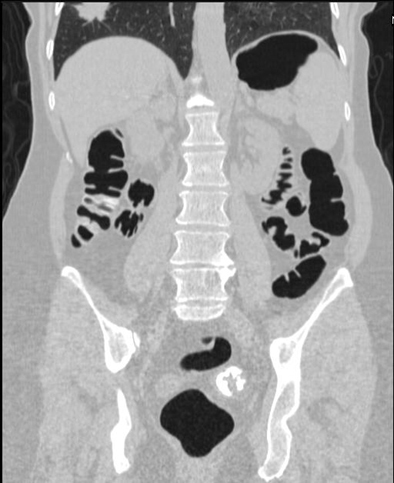 All images were evaluated using a primary 3D interpretation method (V3D-Colon, Viatronix, Stony Brook, NY) by one of seven experienced radiologists, who noted their findings according to the CT Colonography Reporting and Data System (C-RADS) to classify colorectal as well as extracolonic findings. Individuals with two or fewer 6- to 9-mm polyps had the option of undergoing short-term polyp surveillance or same-day colonoscopy, and colonoscopy referral was automatic for patients with large colorectal polyps (≥ 10 mm) or suspected colonic malignancies. "For the purposes of this study, we focused on patients with a pathologically proved invasive CRC, defined as spread of malignant cells beyond the muscularis mucosae," excluding advanced polyps and all known malignancies from the analysis, Pickhardt and colleagues explained. For those with pathologically proven unsuspected cancers found at CTC, all workups, staging, treatments, and outcomes were logged and tabulated. Unsuspected malignancies were confirmed in 58 (0.56%) of the 10,286 subjects, including colorectal cancers in 22 (0.21%) patients and extracolonic cancer in 36 (0.35%) patients. Patients with unsuspected malignancies were slightly older (mean, 60.8 years) than those without cancer (mean, 59.8 years; p = 0.32), and women comprised a slight majority of cancer cases (56.9%) despite their being a slight minority (47.6%, p = 0.13) among the entire screening cohort. Cancer detection rates were similar at both medical centers (28 of 5,576 versus 30 of 4,710, p = 0.41). None of the differences were statistically significant. The colorectal tumors tended to be large (mean size, 3.3 cm ±1.6; range, 1.1-8.0 cm), "appearing as either frankly invasive masses or malignant polyps," the team wrote. They included eight cancers in the sigmoid colon, five in the cecum, two in the transverse colon, three in the ascending colon, and one in the descending colon. Most of the colorectal cancer patients had stage I disease (n = 12 patients, 54.5%), three patients had stage II disease, four patients had stage III disease, and two patients had stage IV disease at diagnosis, the authors wrote. As for extracolonic lesions, the mean patient age (61.3 years) was similar to the general cohort, and gender (19 women, 17 men) did not differ greatly from the entire group. The most common extracolonic primary cancers were renal cell carcinoma (n = 11, including 10 stage I), followed by lung cancer (n = 8, including three stage I, one stage II, three stage II) and non-Hodgkin's lymphoma (n = 6). In addition, two patients had prostate cancer and two had localized adrenal cancers. Some of the other cancers detected included a breast cancer, a stromal cancer in the stomach, a carcinoid tumor in the appendix, and a stage I adrenocortical carcinoma. "Our findings show that unsuspected cancer is found on average more than once every 200 adults screened, and most are extracolonic malignancies," the authors wrote. "At first glance, it may seem paradoxical that extracolonic cancers outnumber invasive CRC given the indication and focus of the examination. However, CRC was still the predominant cancer identified, followed by renal cell carcinoma, bronchogenic carcinoma, and non-Hodgkin's lymphoma." Nevertheless, the identification of colorectal polyps remains the greatest benefit of CTC. "Large polyps (≥ 10 mm) are detected in 4% to 5% of asymptomatic adults undergoing CT colonography in our screening programs, corresponding to nearly 500 patients in this cohort," Pickhardt and colleagues wrote. Virtual colonoscopy provides a limited view of extracolonic regions including the abdomen, pelvis, and parts of the lungs, and additional diagnostic tests are required in about 6% of cases, "nearly half of which ultimately prove to be clinically relevant," Pickhardt said in his statement. Of note, the study found no presymptomatic pancreatic or ovarian cancers. As of the publication date, one patient with an unsuspected malignancy had died of apparently unrelated causes. Optical colonoscopy cannot examine anatomy beyond the colon, Pickhardt noted, while CTC "can detect a wide array of unsuspected extracolonic diseases, most notably cancers and aortic aneurysms." Still, the authors emphasized the limitations of such a limited view of extracolonic structures, and the importance of considering the potential effects of biases that can lead to overestimation of detection rates and survival, including lead time bias, length bias, and overdiagnosis bias. "Potential biases aside, a disproportionate number of the asymptomatic screening-detected cancers in our series were localized at an early stage, which appears to have positively affected the expected short-term survival," they wrote. "There is abundant evidence that cancer survival is largely related to the stage of disease and that symptomatic cancers tend to present at a more advanced stage." Clinically unsuspected cancers were found in the generally healthy cohort at a rate of about one case per 200 individuals screened, they concluded. "Although invasive CRC was the most common malignancy overall, most detected cancers were extracolonic in location," they wrote. "Presymptomatic detection of unsuspected colorectal and extracolonic malignancy resulted in a high rate of localized or early-stage tumors, with a very favorable clinical outcome to date."